Carrying a deadly weapon in public should carry unique responsibilities. In most cases someone with a gun should not be able to escape culpability if he initiates a conflict with someone unarmed and the other party ends up getting shot and killed. Under the current law in many states, people threatened by armed people have few good options, because fighting back might create a license to kill. Maybe people like George Zimmerman should be held responsible for provoking the fight that they then fear they’ll lose. … But you can see the box the jurors might have felt they were in. Even if they didn’t like George Zimmerman—even if they believed only part of what he told the police—they didn’t have a charge under Florida law that was a clear fit for what he did that night. Here’s what seems clearest to me about the killing: George Zimmerman was looking for trouble that night and Trayvon Martin wasn’t. I’m not sure exactly how the law should account for that, but I have a hard time believing that if Martin had killed somebody under similar circumstances, he wouldn’t be convicted of something. Various cases have been proposed as analogs, like this one. Weaponry and the law. At the American Prospect, Scott Lemieux points out widespread concealed-carry of weapons combines very badly with stand-your-ground laws. A person with a concealed weapon should bear a special responsibility to avoid violent confrontations, knowing that such a confrontation may well lead to someone’s death. Race. A year ago, Frontline ran some numbers about homicides. 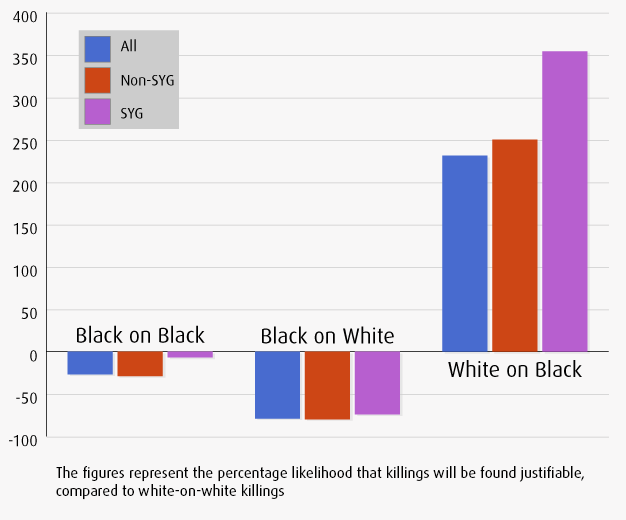 Juries are more likely to believe white-on-black killings are justified, particularly in stand-your-ground states. Zimmerman’s future. Zimmerman’s attorney is pushing the notion that his client has suffered a great wrong, and faces a difficult future. Seriously? If he wants to, Zimmerman can have a lucrative career as a symbol for the NRA and other conservative groups. I’d be amazed if a book wasn’t already being ghost-written for him. I wonder who will play Zimmerman in the movie of his persecution by scary black people. Fearmongering. Again and again, right-wing pundits have raised the specter of a violent black response, but Trayvon Martin continues to be the only casualty here. Post-verdict demonstrations across the country were peaceful, with the lone exception of Oakland, where some windows were broken but no one hurt. I noted the same pattern in the weeks after the killing: Conservative sites like Glenn Beck’s The Blaze devoted article after article to speculation about black violence, while showing little empathy for the only person who actually died. In short, the conservative media has presented the killing of a black teen-ager primarily as a reason for whites to be afraid. or, more accurately, The Myth of the Zombie Voter and To Succeed, Fail Boldly. Last week I denounced the Religious Right misusing “religious freedom” as an excuse to control other people. Well, this week there’s more. The House has attached a Religious Liberty amendment to the annual National Defense Authorization Act, one of those omnibus bills that has to go through somehow. It extends protection of soldiers religious “beliefs” to “beliefs, actions, and speech” and restricts commanding officers’ options for avoiding religious conflicts within their units. No longer will name-calling and harassment be prohibited if these “sticks and stones” merely pose a threat to good order and discipline; they will have to result in actual harm to good order and discipline. In other words, a commander will no longer be able to head off a potential breach of good order and discipline in their unit … they will have to wait until such name-calling escalates to a point where … the unit cannot function efficiently. The foreign press continues to spank the American press for its lapdog coverage of the NSA scandal. Germany’s Spiegel throws a spotlight on a false Walter Pincus column that embarrassed the Washington Post. The 32-page opinion is full of legal precedents and so forth, and without a whole more study I can’t offer an opinion on whether the judges got the law right. (The outcome is unjust, but maybe the law is unjust and the Court’s hands are tied. As Oliver Wendall Holmes is supposed to have said: “This is a court of law, young man, not a court of justice.”) But wouldn’t this decision be a whole lot more credible if there were at least one woman on the Court? Here’s something I can say without further study: The dentist is a jerk. Not only did he fire this 10-year employee without warning for no fault of her own, but he gave her only one month’s severance, which even the Court called “rather ungenerous”. A bipartisan coalition of senators have introduced “The 21st Century Glass Steagall Act”. It would restore the New Deal’s separation between commercial banks (which ordinary people count on to store their money safely) and investment banks (which can deal in complex derivatives that nobody really understands). “Banking should be boring,” Elizabeth Warren explains. Our new 21st Century Glass Steagall Act once again separates traditional banks from riskier financial services. The symbol of Glass Steagall’s success was the separation of the Morgan Bank (now J. P. Morgan Chase) from the Morgan-Stanley Investment Bank in 1935. But today J. P. Morgan Chase owns Bear Stearns, and Bank of America owns Merrill Lynch, just to name two obvious examples. Taken together, the cuts to contraception funding, the cuts to welfare, the restrictions on abortion, and the money flowing to crisis pregnancy centers paint a very grim view of how Ohio Republicans see women—and low-income women especially: as baby factories that need to dramatically increase production. You can call that “pro-life” if you want, but it’s increasingly clear that it’s just anti-woman. Why oh why do Ron and Rand Paul keep running into these problems with their Neo-Confederate and white supremacist associations? Josh Marshall has an irreverent answer. 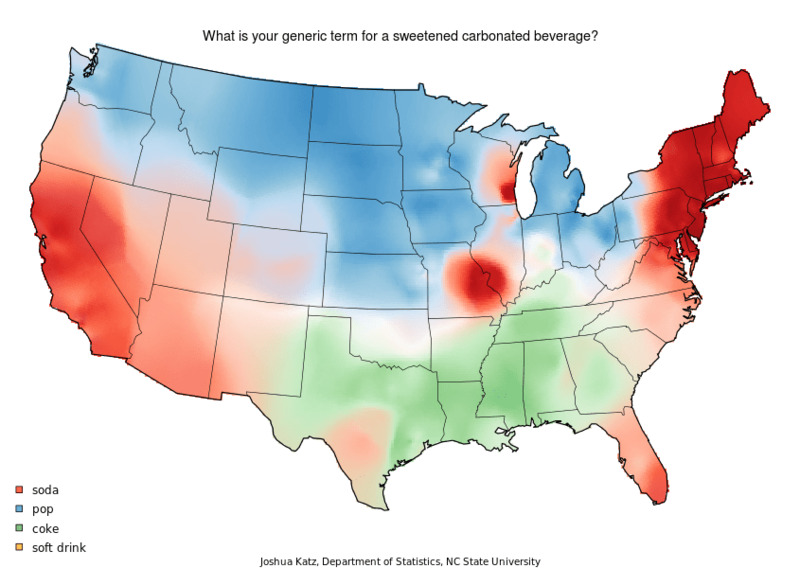 Everybody knows that different parts of the country speak have different words for things and pronounce them differently, but it’s fun to see where the boundaries are. So how come St. Louis and Milwaukee are little islands of red in this map, but nearby Chicago and Des Moines aren’t? “the mathematician in me has to point out that the white-on-black color breakdown can’t be right.” -I’m not sure, but I think it could be an example of Simpson’s Paradox, especially since there are fewer of those in the data than the other categories. That article by Josh Marshall was stunningly badly written. but I think I got his point. People carrying guns around has got to increase the amount of aggression in society, and things like the Zimmerman incident will happen.